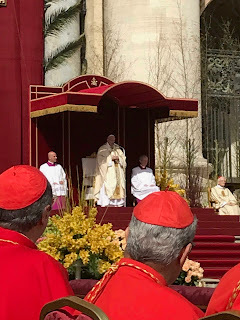 Easter was a GLORIOUS day here in Rome for so many reasons! 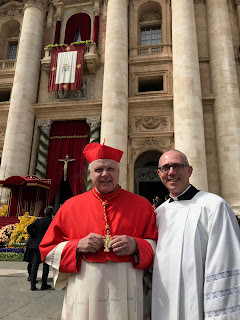 First, of course, the spiritual joy and blessings of the day; but also the wonderful fraternity and community here in Rome among the American priests/seminarians... and the weather. 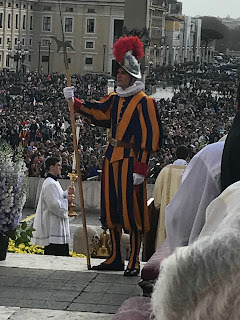 We awoke Easter morning to a TON of security all around our building. 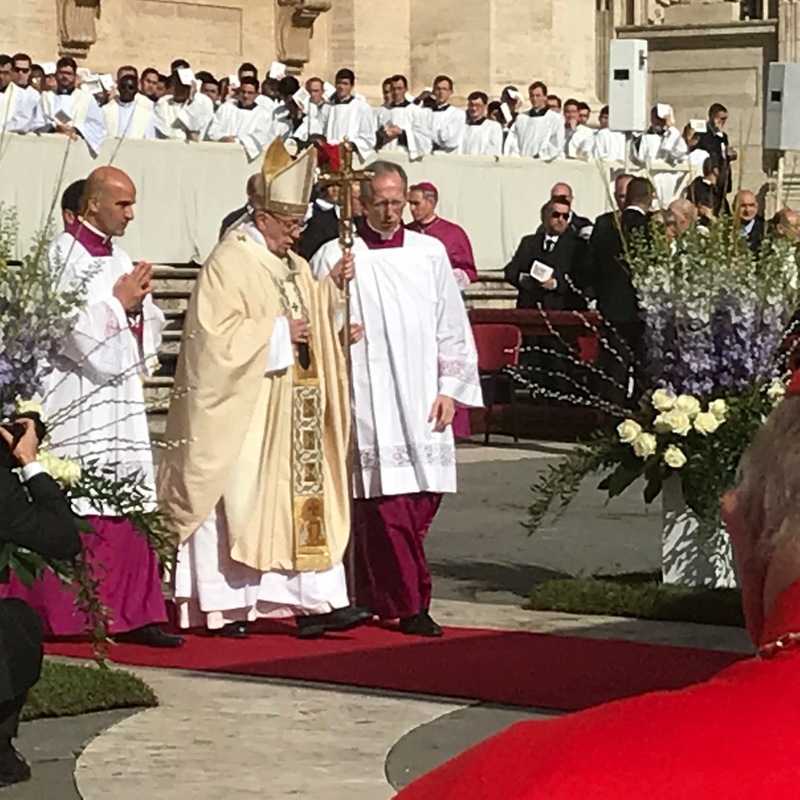 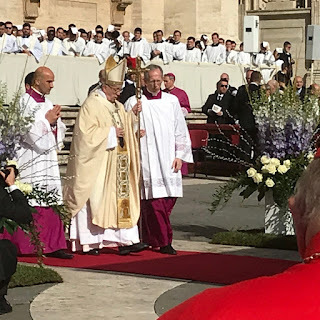 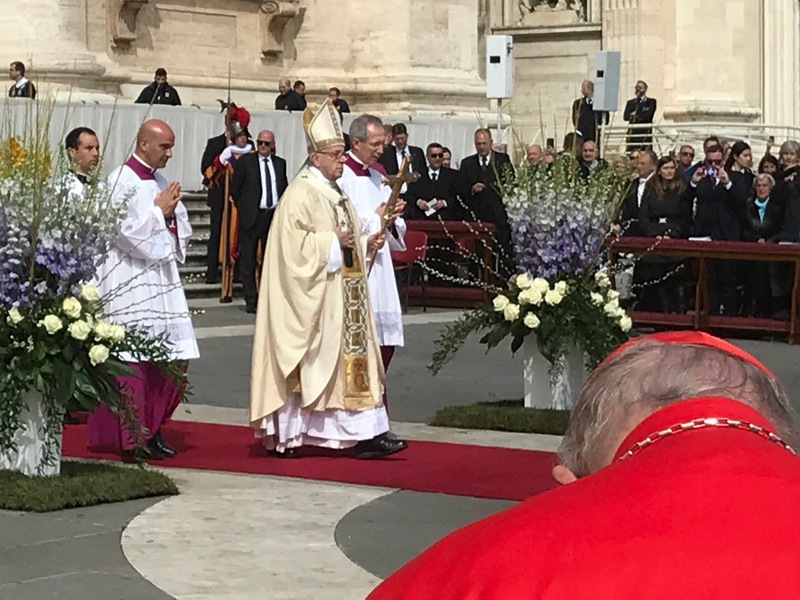 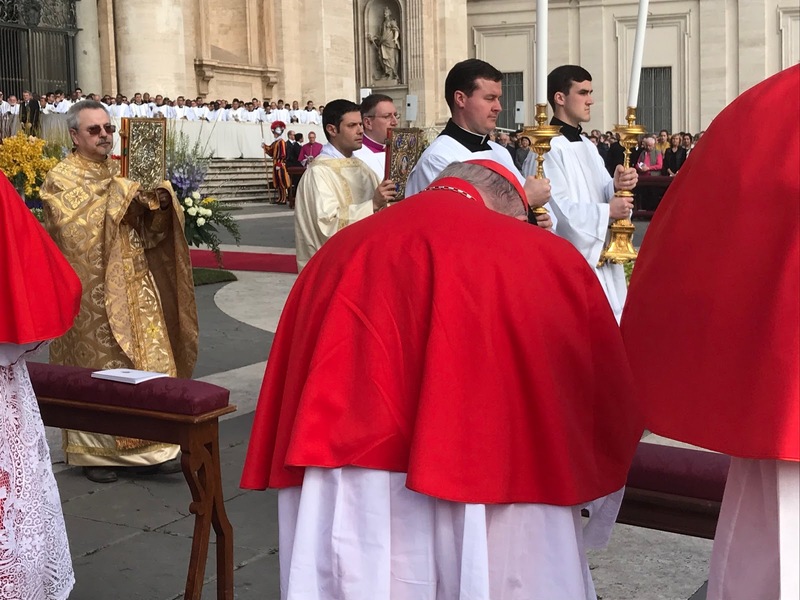 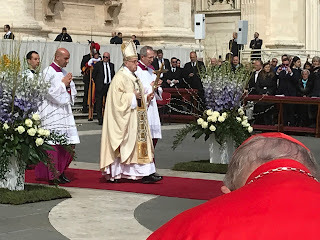 You may certainly have heard in the news of various threats of attacks here in Rome during the Easter celebrations - so security was extremely tight around St. Peter's Square where the Holy Father presided at an outdoor Mass for 1000's of people gathered to celebrate the Lord's Resurrection. 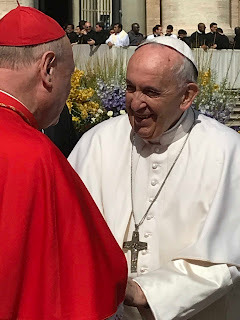 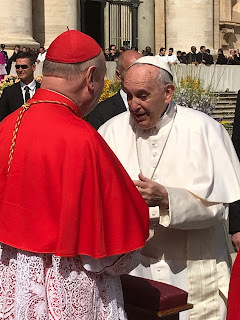 The Cardinal and I headed toward the Square for the 10am Mass and were quickly met by a member of the police force who, recognizing a Cardinal, personally escorted us through security and right up to the steps of St. Peter's Basilica. 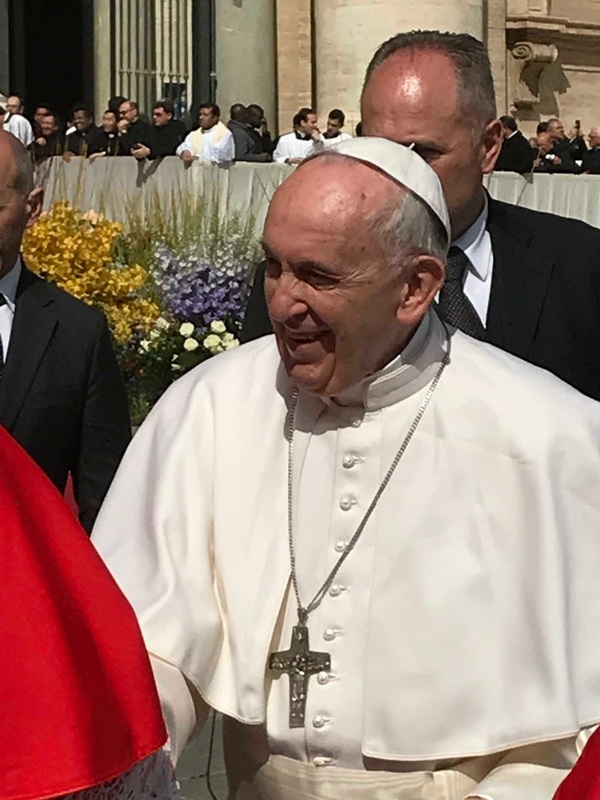 We heard from several pilgrims how tight security was, but how GOOD and friendly the security forces were. Everyone understands the situation and the need for security - it is an unfortunate reality in our world today. 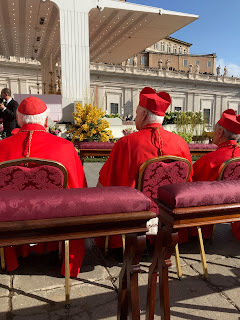 So, we get up to the seating area close to the Papal altar in front of St. Peter's - and we went our separate ways (as usual) because the Cardinal, naturally, as special seating. I, on the other hand, simply find a place near the other priests. 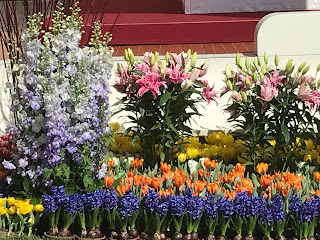 I've learned that if you just act like you belong there, they simply let you be. 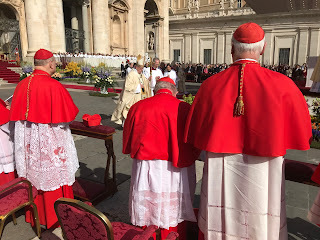 Well today, after being moved several times by the ushers, I ended up in a seat directly behind the Cardinals - RIGHT behind him, in fact. 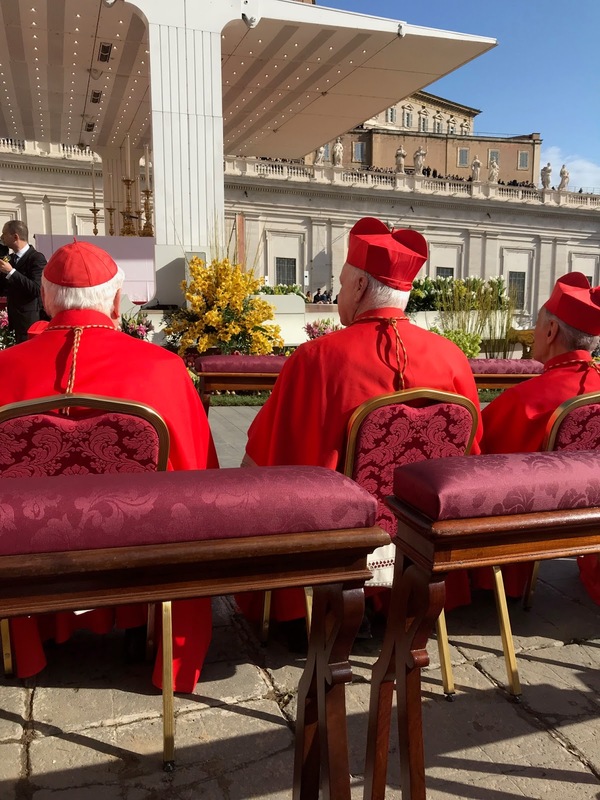 NOT A BAD SEAT! At this Easter Sunday Mass there is no concelebration - not even the Cardinals. So we were all "in choir" - meaning wearing cassock and surplis. 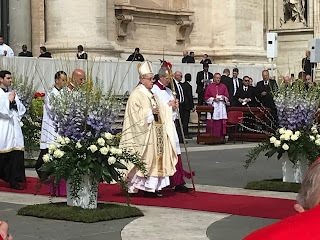 It wasn't long before the music began and the Holy Father entered from the Basilica. Once again, the music was beautiful, the celebration of the Mass joyful. There is a wonderful custom here at big Papal liturgies to proclaim the Gospel not only in Latin (or Italian), but also in Greek - recognizing our unity with the members of the Eastern Churches. 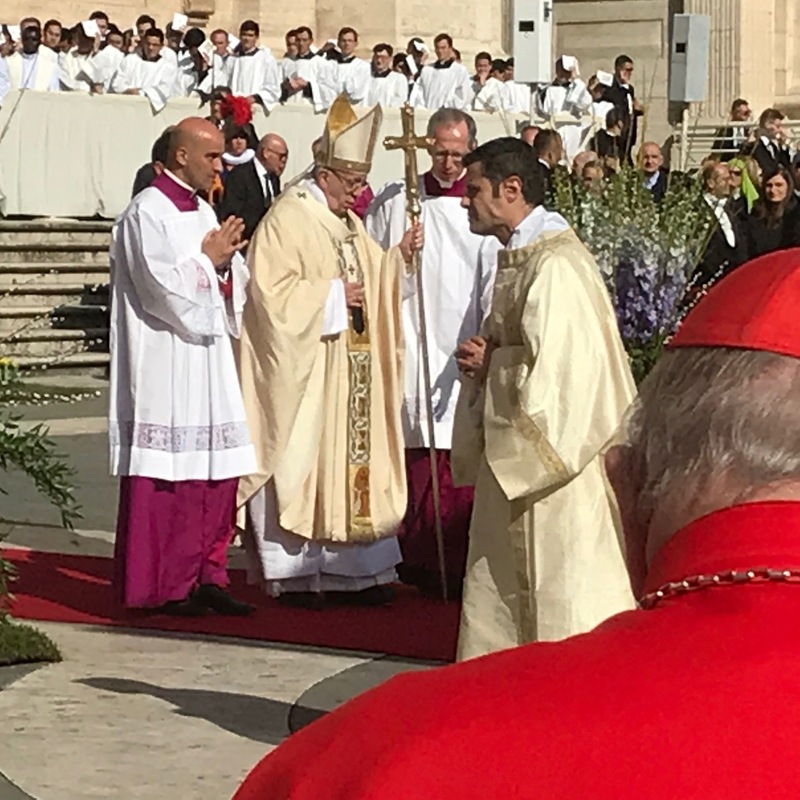 Here's the best shot I could get of the Gospel procession and its being proclaimed. (you can see the Eastern rite priest on the left and the Latin rite deacon on the right). Below, if you look to the right of the Swiss Guard, you can see the deacon at the ambo - and the size of the crowd gathered in the Square for Mass. 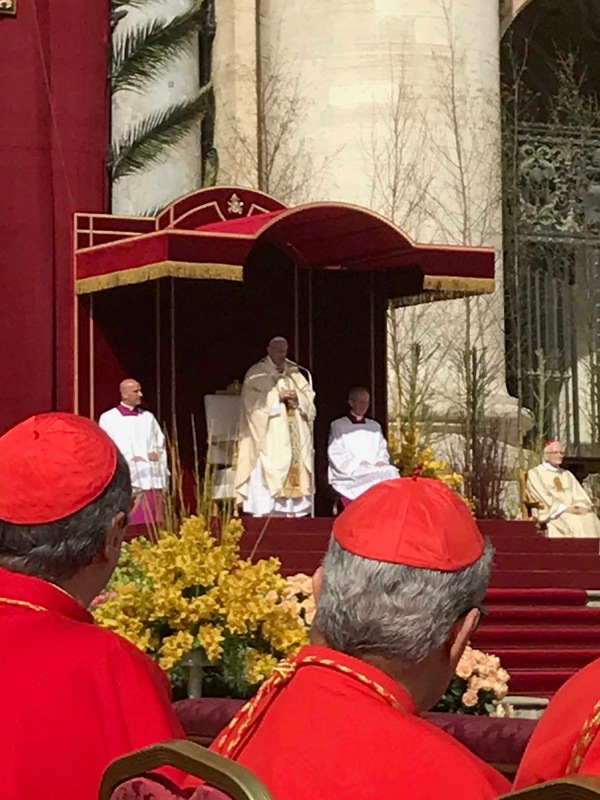 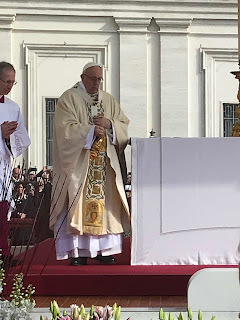 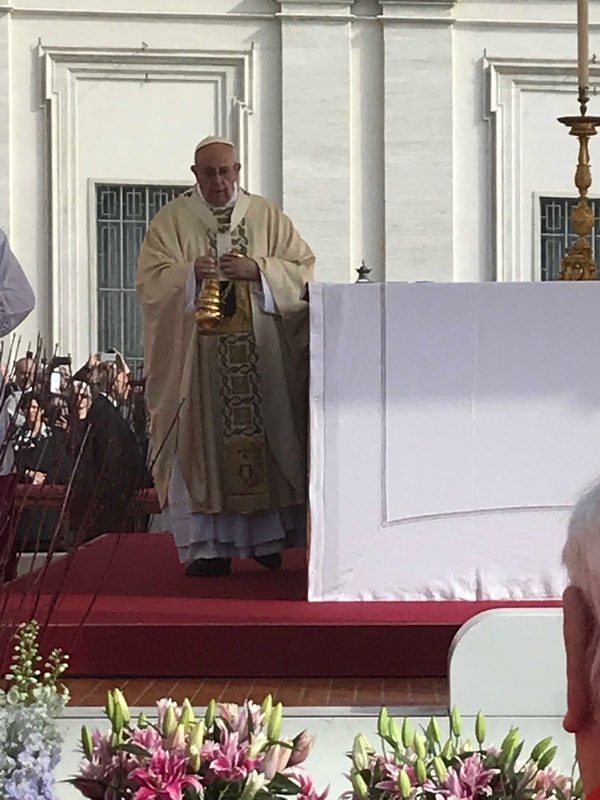 Of course the Holy Father preached, from his heart and without a text, speaking, he said, just three thoughts for our Easter celebration: God surprises us; Responding quickly to God's surprises; What about me? 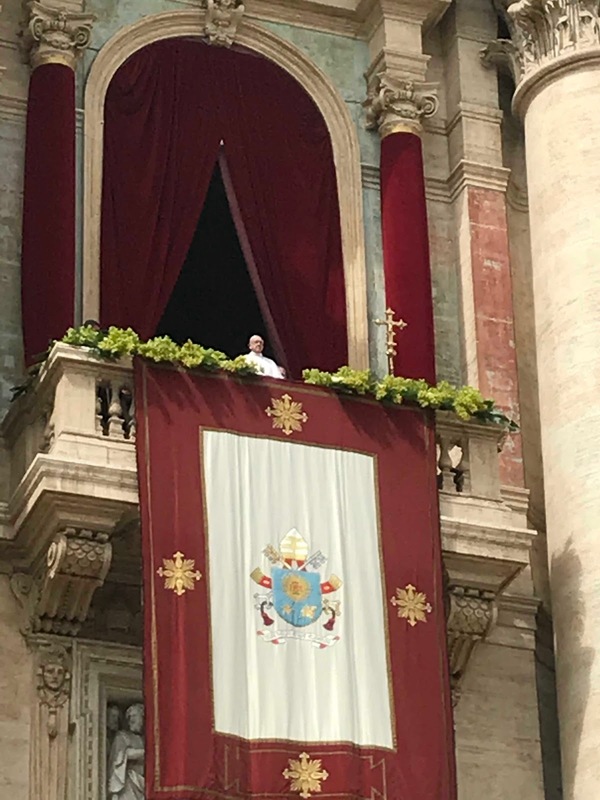 How do I respond? 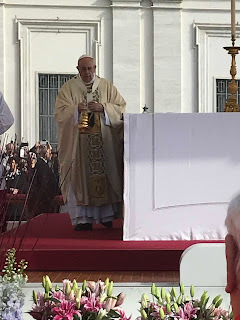 It really was a very good extemporaneous homily with lots of food for reflection. 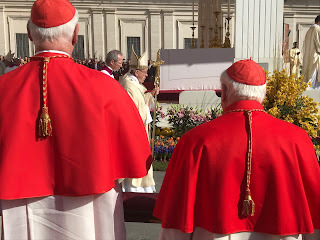 Following the Mass the Holy Father always removes his vestments and greets all the Cardinals who are present. 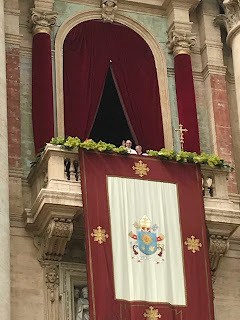 Because I was seated directly behind them, I got some really good photos! 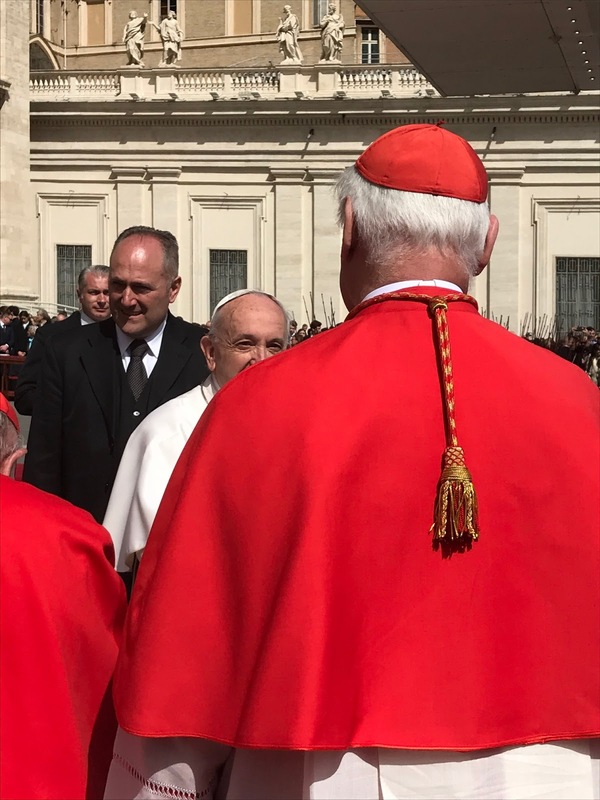 For anyone who kind of pays attention to Church-related issues, the photo on the left is Pope Francis greeting Gerhard Cardinal Müller. 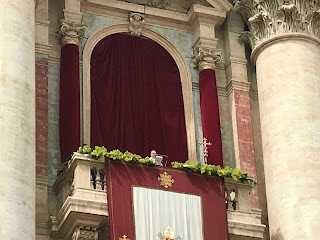 There is one other really cool thing that happened Easter morning - but I won't have the photos to prove it for a couple of days... so you'll have to stay tuned to see what it is that happened... And I also want to gather some thoughts to share with you my own personal reflections on the Easter joy which we celebrate in Christ's resurrection.